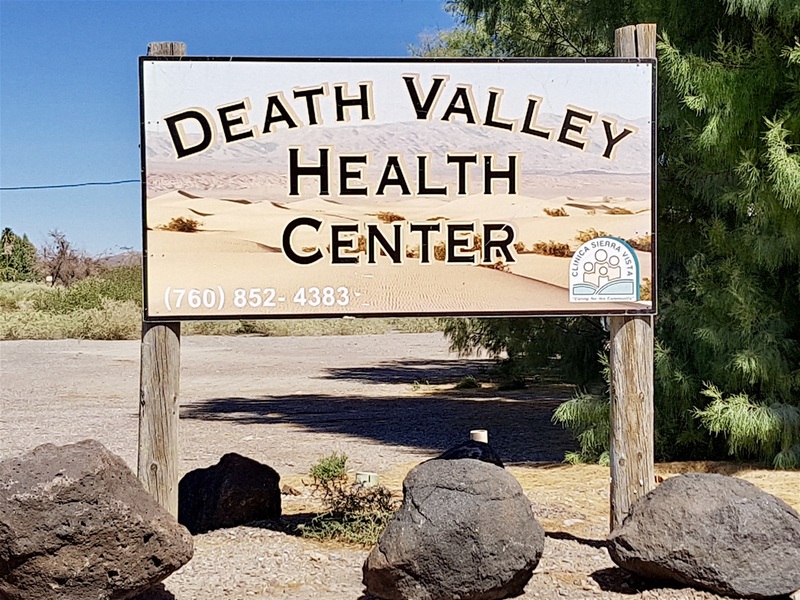 Ruminations on Las Vegas and onward to Death Valley. As attractions, they're polar opposites. Las Vegas was the place we’d discussed most before setting off on this road trip. Neither Marigold or I were all that keen, but we would be ‘in the area’ so thought we should try it for a couple of days to form a reasoned opinion. So, what did we think of Vegas? We can see why so many people love it. It’s a party town with a relaxed attitude to most things, its integral hedonism overwhelming the new arrival in an instant. It’s also brash, loud, vulgar and in your face. Vegas exists for one purpose and one purpose alone: it’s a vast steaming money pit of a city unlike anywhere else. Monte Carlo has a casino, but there the similarity ends. No chance of a fridge in your bedroom, not even a coffee machine, they don’t want you spending any more than the minimum sleeping time there. If you’re in your room, you’re not spending money and money is the entire raison d’etre of Vegas. 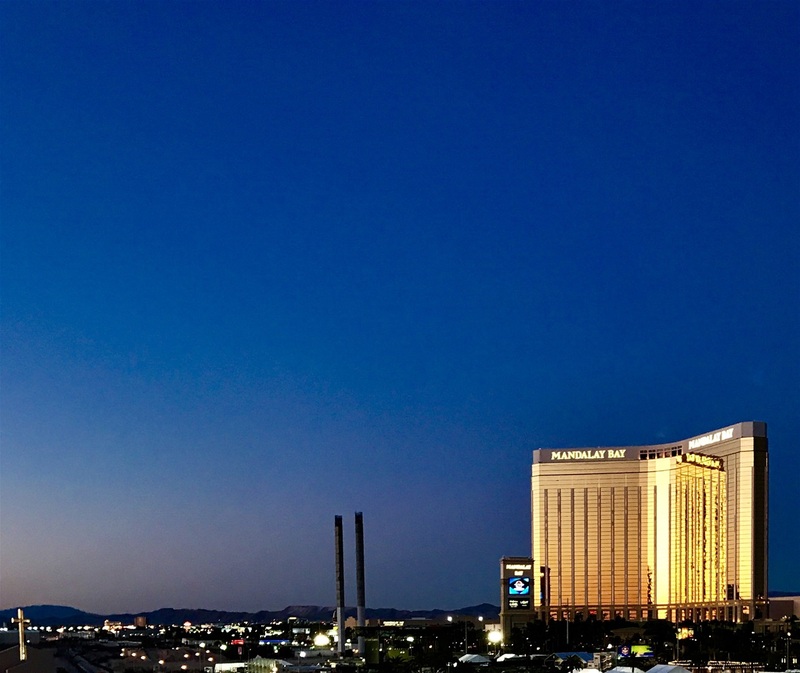 Not the fault of Las Vegas, it did its level best to win us over with its lights, its vibrancy and its pursuit of pleasure, but it won’t be drawing us back. We enjoyed ourselves, we always do, but Vegas faced stiff competition from what we’ve already seen on this trip. The Pacific coastline, the Grand Canyon, Yellowstone, Moab, Monument Valley, the list goes on and every one knocks spots off the carefully arranged artifice of Vegas. Yes, you can recreate Paris, Venice, Luxur, but we’ve been to Paris, Venice and Luxur so the comparison isn’t flattering. Each hotel spends and spends to beat its neighbours, but step inside and they’re all the same. Vast smoke filled rooms designed to persuade visitors they can get rich quick. I looked at an ashtray next to her, piled high with stubbed out cigarettes. He went back to work. Not exactly with a spring in his step. Sorry, Vegas, we’re off too. Two days here and we were more than ready to move on. Both of us are glad we came, we laughed a lot, saw some ‘sights,’ the human variety more memorable than the artificial, and can understand why for so many it is a dream destination, but there’s far more out there we have yet to see. We’re heading for Yosemite National Park, but as we want to experience Death Valley, we’re going to spend a day in the desert along the way to Yosemite. We’ve now left ‘mountain time’ behind and reset our watches to add a further hour. Very confusing, all this. Very soon we’ll be back in California. So far on this road trip we’ve passed through California, Arizona, New Mexico, Colorado, Wyoming, Idaho, Utah and Nevada. A lot of States, a lot of different roads and by the time we arrived in Las Vegas, over 3,300 miles behind us so far with much more yet to see. 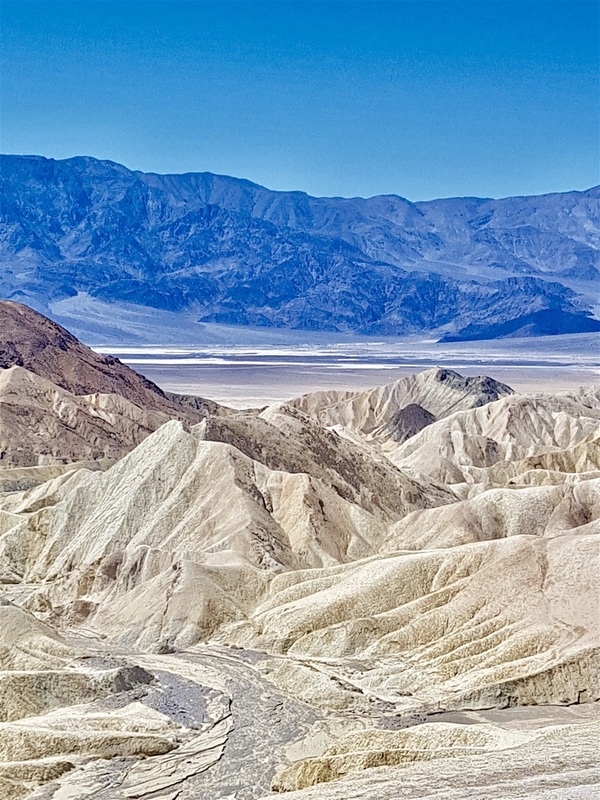 The Death Valley National Park website informs us that it is ‘America’s Hottest, Driest, and Lowest National Park’. 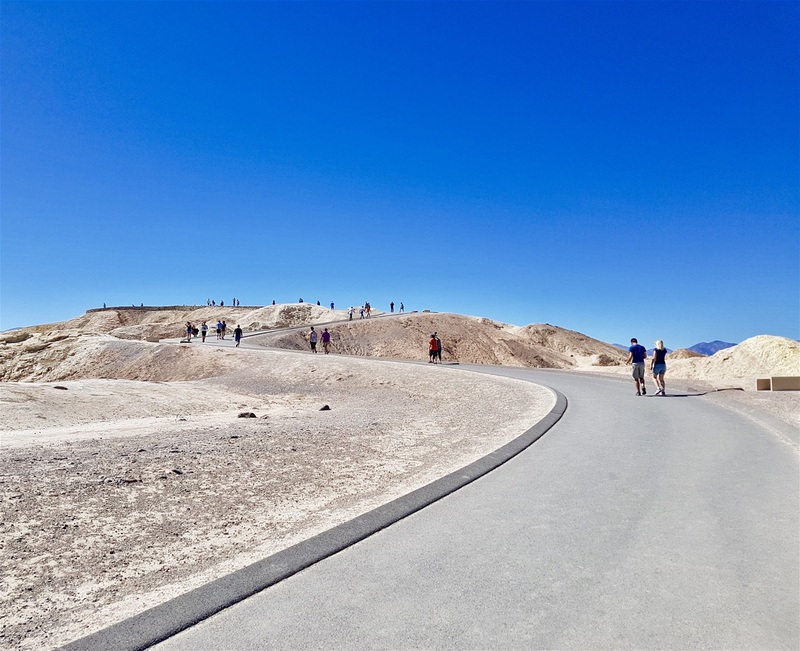 The valley floor is 272 feet below sea level, yet the highest point in Death Valley itself, Telescope Peak, rises to 11,043 feet and only a mere 84 miles away is Mount Whitney, the highest point in the US at 14,595 feet. Hottest? Oh yes. 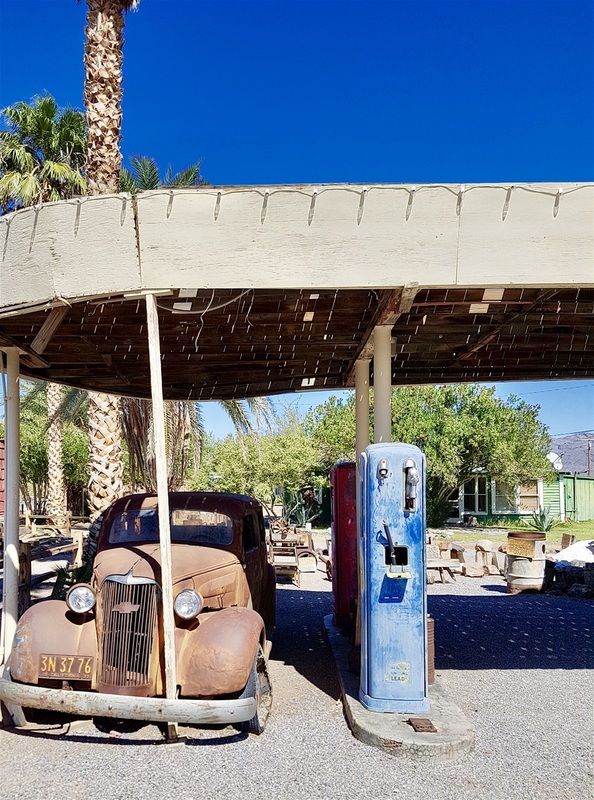 The appropriately named Furnace Creek in Death Valley holds the record for the highest recorded air temperature in the world, 134 °F (56.7 °C) on July 10, 1913. Thankfully, it was a fair bit cooler than that today. The traffic was set at not much more than manic level. Where are they all going, we wonder, at seven in the morning? Sadly, the place itself failed to grab our attention. A few observations: they make fireworks here. We’ve seen more than a few fireworks stores/factories dotted around the region. 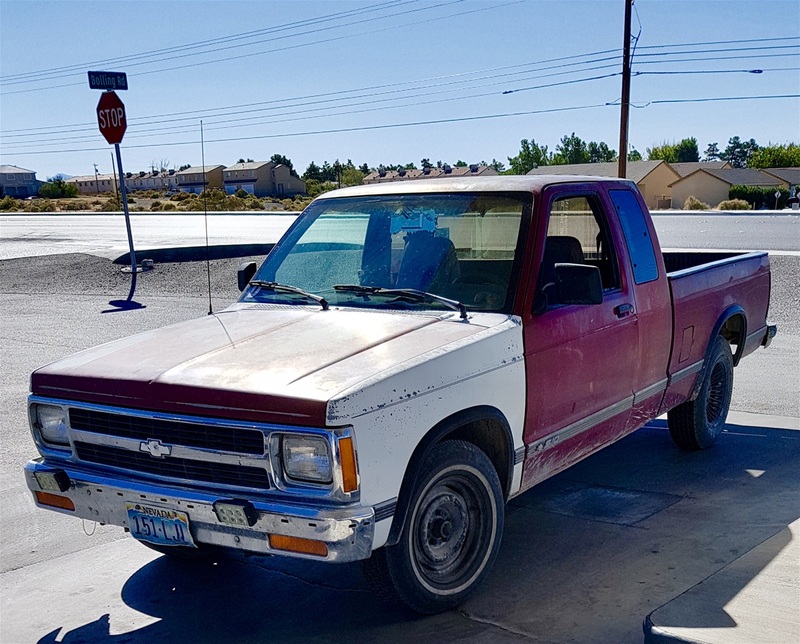 Pahrump appears to be a main dealer. There are RV parks galore. Again, that’s not unusual; every dot on the map has an RV park. There are casinos, not up to Vegas standards, but local. I noted there was a ‘Terrible’ country store, but it turned out to be the name of the owner. Even so, Terribles’ Country Store doesn’t sound great. What else can Pahrump offer? Flu shots are well advertised. There’s a firing range - ‘fire a machine gun today’ – and, oh yes, better not forget, get your marijuana here. Cannabis now legal in Pahrump, the signs proclaim. Both recreational and medical marijuana are legal now in Nevada. Anyone over 21 can buy up to an ounce of weed, at a time. I filled up with petrol on the edge of town. Not one of the flashy service stations this; they offer ‘day old bread’ for 99 cents. Next to me as I fill up is a bearded ‘mountain man’ driving a seriously battered Toyota. 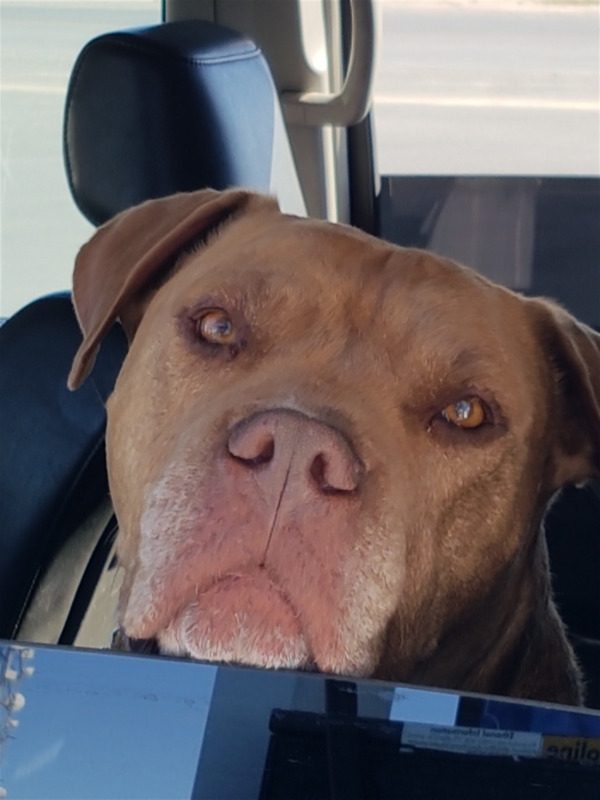 In the passenger seat is a massive pit bull terrier, glaring at me. I show him to Marigold who doesn’t seem interested in stroking him. The Toyota drives off in a vast cloud of smoke with big ugly Ken leaning way out of the window. He’s a lovely dog with a nature far removed from his villainous appearance. Leaving Pahrump we head to one of the places I’ve read about and want to see for myself. 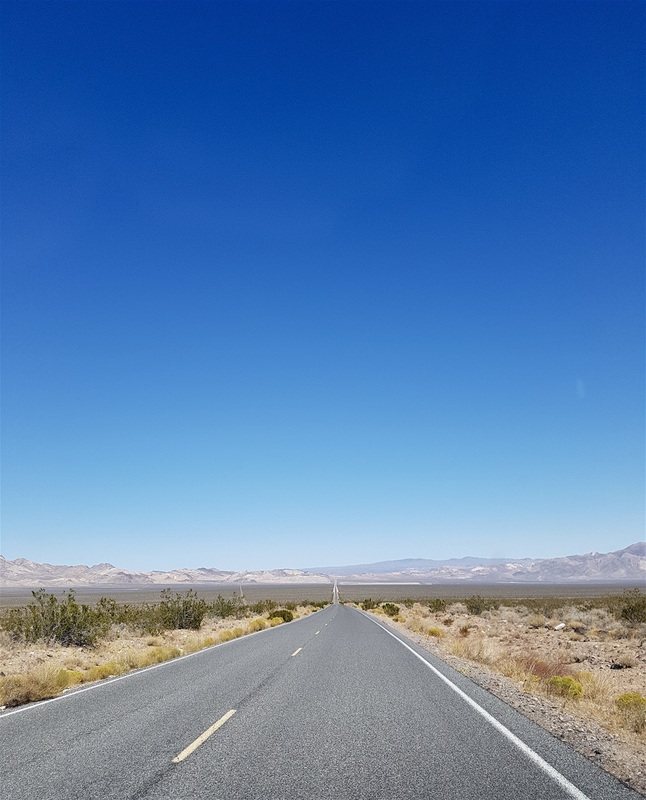 Between Pahrump and Shoshone there’s bad dead straight road with cactus on either side and absolutely nothing else. 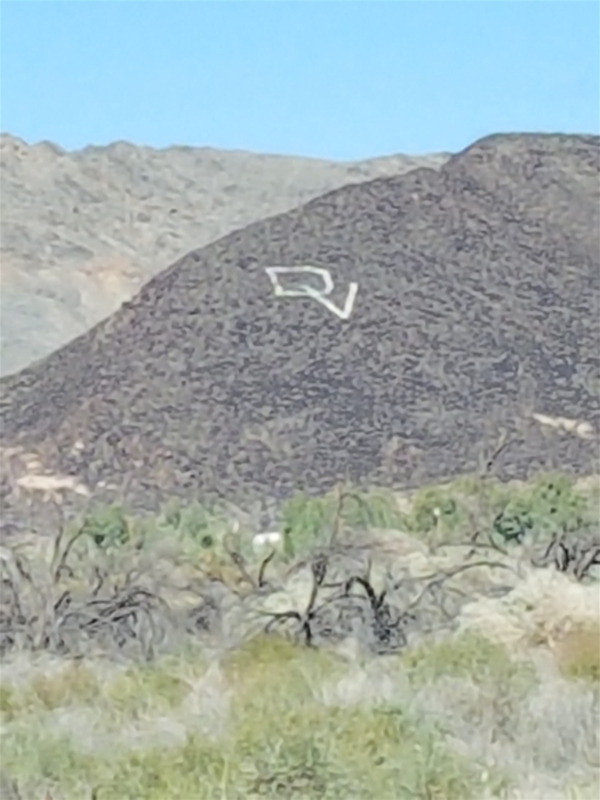 Oh, there’s a big sign scratched into a hillside that says DV – Death Valley – in the distance, but that’s all. 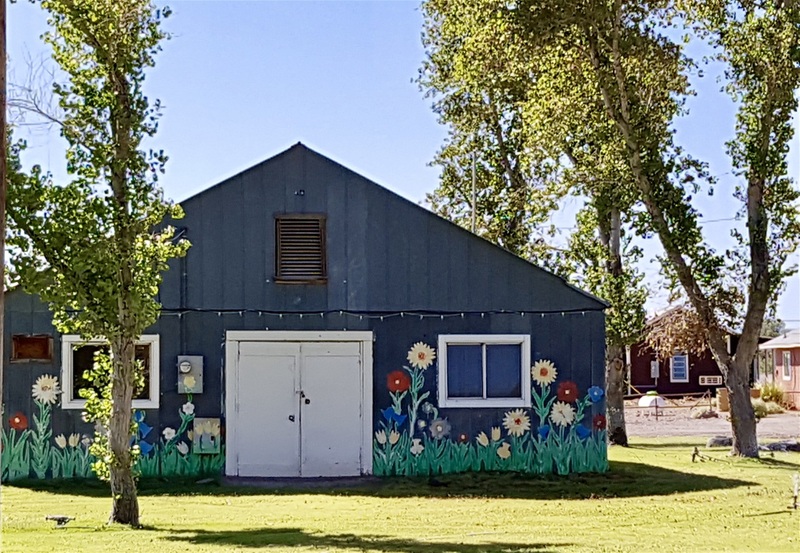 Shoshone was founded in 1910 and according to the most recent census has a population of 31, down from 52 in the year 2000. A population of thirty-one? In some cultures that’s called a family! We’re back in California, for a while, now. The Welcome to California sign at the side of the road is riddled with bullet holes. Good old boys from Nevada demonstrating their freedom of expression in the traditional manner of the Old West. 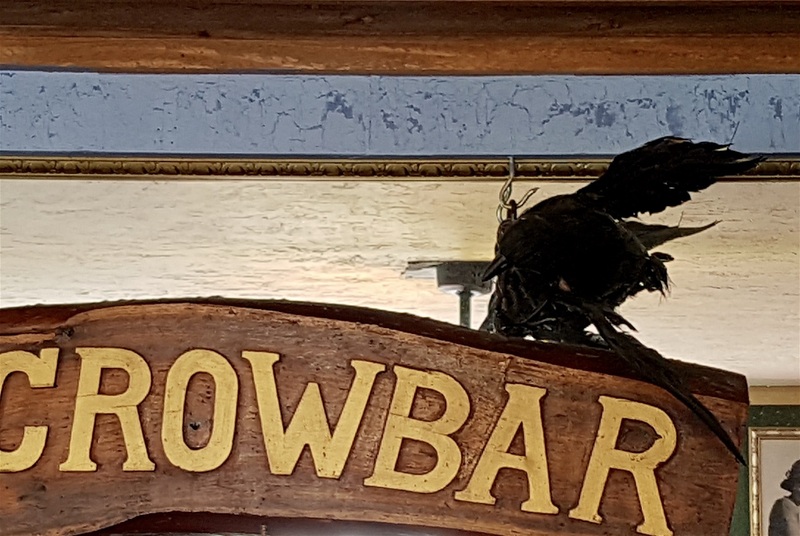 We entered Shoshone on the Charles Brown Highway and the first place we saw was the Charles Brown general store. There’s not much else to see. 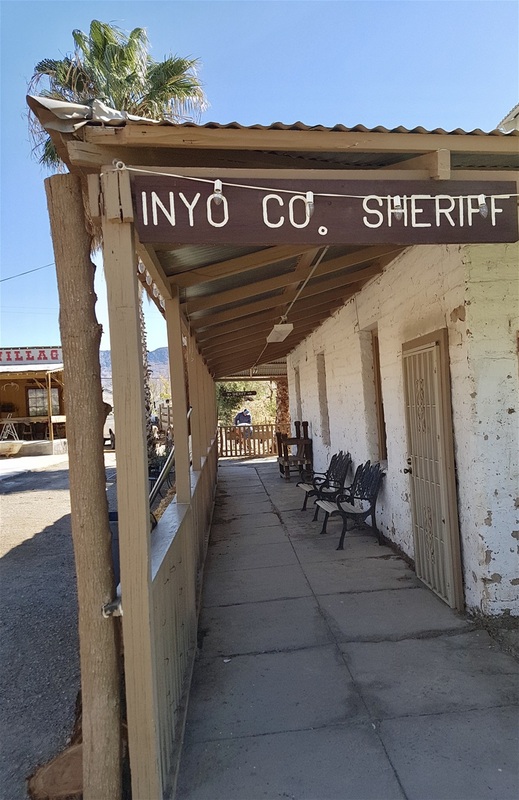 There’s a small RV park, some abandoned bungalows, a pretty uninviting looking saloon, a tiny museum and a café. 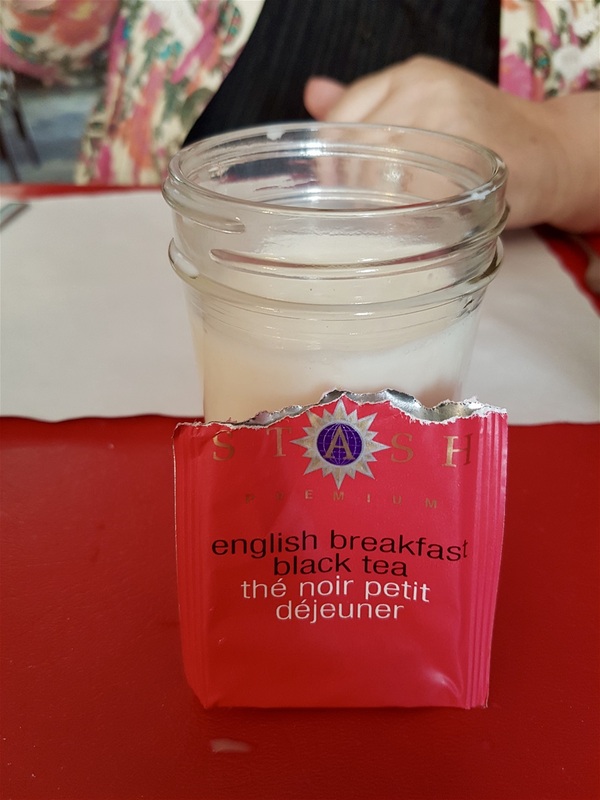 The café though is very special. 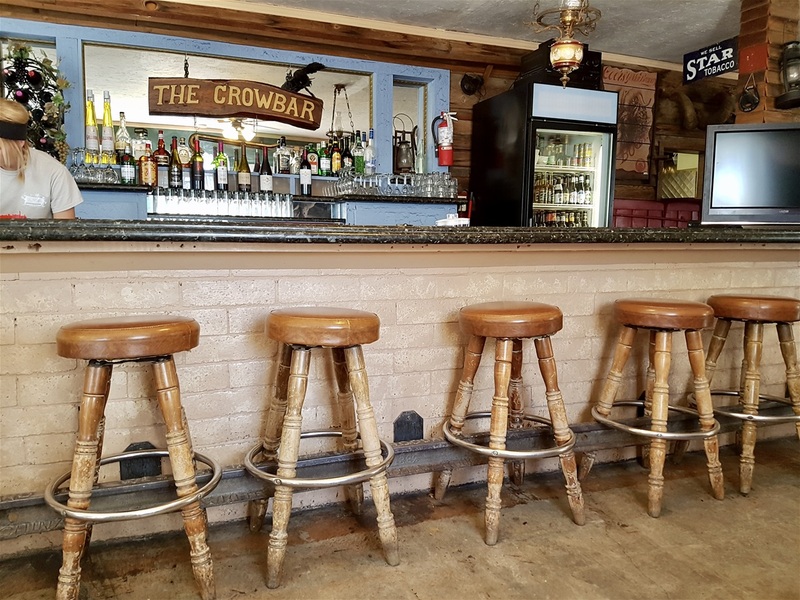 The Crowbar Café and Saloon is located in the heart of Shoshone Village. 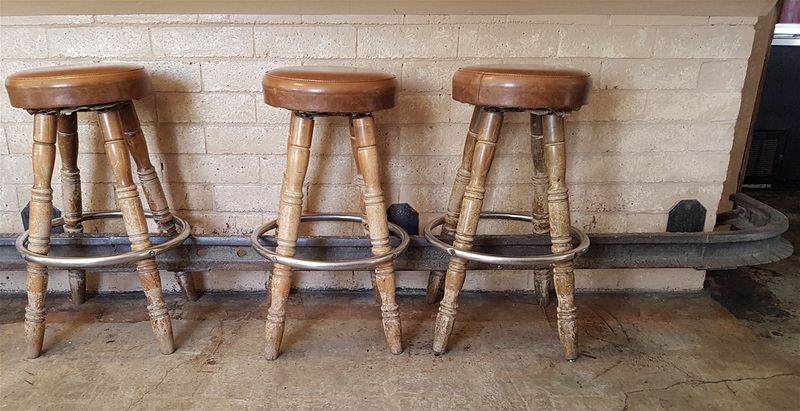 The restaurant was built in the 1930's and still serves ‘handcrafted cuisine in a traditional western atmosphere while the adjoining saloon has long been famous as a meeting place for locals and visitors alike,’ as it says on the menu. It’s a great little place and the young girl who takes our orders is delightful. She’s only worked here for two months, but has cracked ‘waitressing’ in all its aspects. 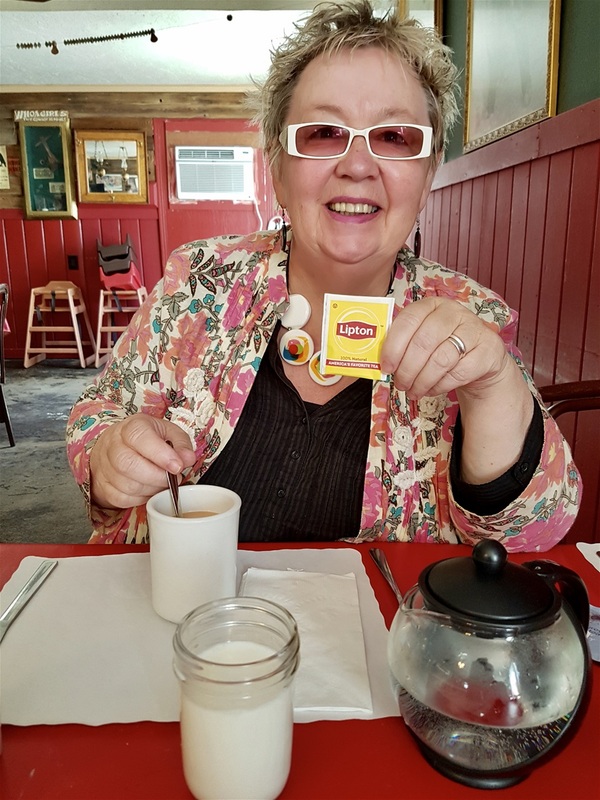 Marigold gets a pot of ‘builders’ tea,’ with extra hot water and a jug of milk so she’s happy. The milk still has flecks of ice in it as they keep it in the freezer! 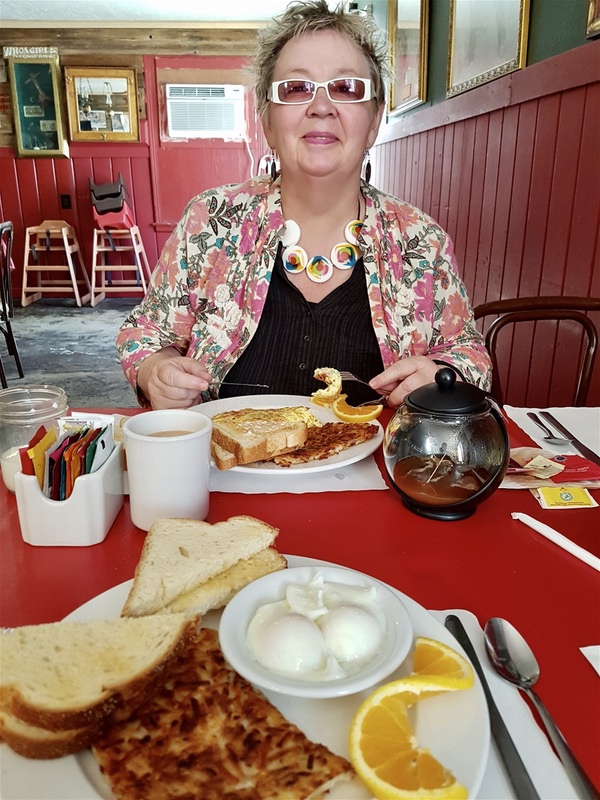 We both enjoy breakfast and enjoy looking round. ‘Seems the Brown family run this town’ Marigold said to our waitress. Outside, across the baking heat of the yard, the ‘facilities’ are simple but serviceable, as they say. The town reminds me of places We’ve seen in the interior of Australia. 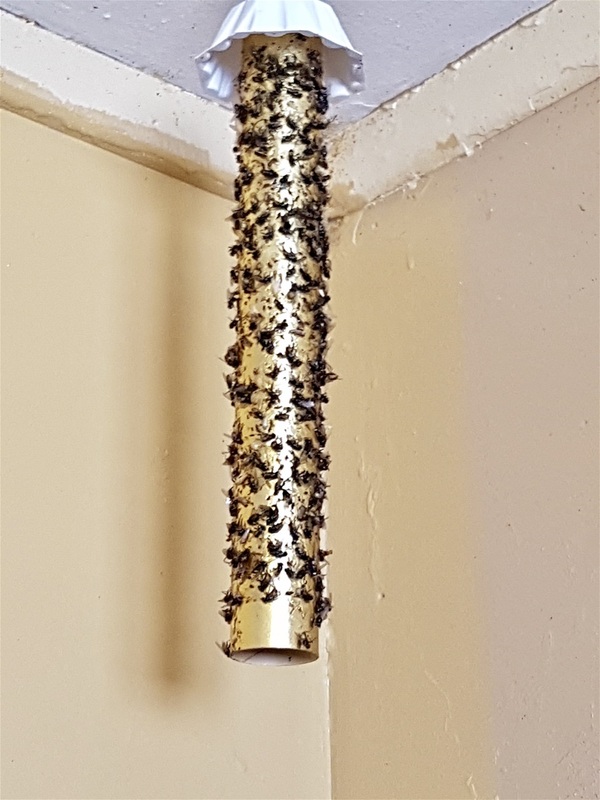 The year round heat, the basic, no frills simplicity of life here, even the fly paper hanging up in the ‘gents’ are all the same. There’s a medical centre here, open five days a week, which for just a handful of residents is surprising. They serve the wider area, apparently, so it’s good to know there’s a safety net for the folk who live in this isolated region. 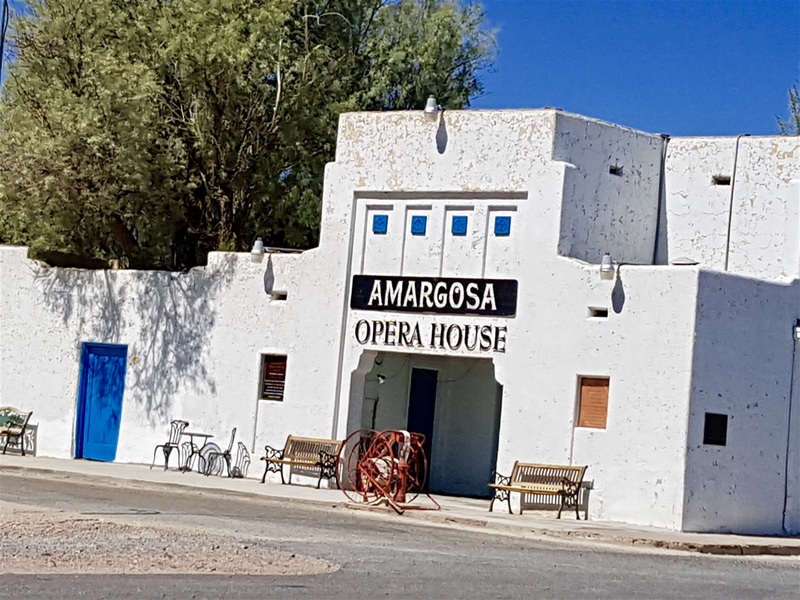 Just before we hit the actual Park we pass through Amargosa with the incongruous sight of an opera house alongside the road. 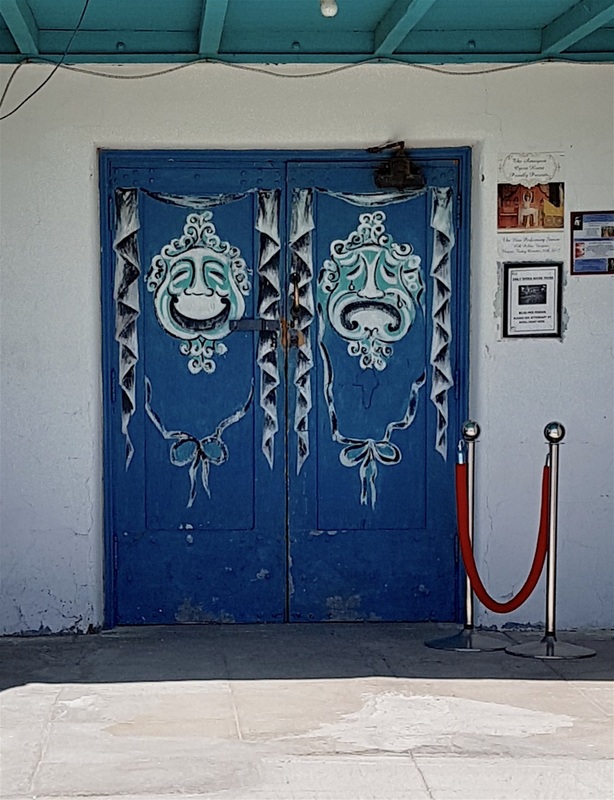 Resident artist Marta Becket, who also painted the decorations on the doors, staged shows there from the 1960s until her final show in 2012. Hard to believe now, but Amargosa used to be a boom town when the borax mining was at its height. National Geographic ‘discovered’ Ms Becket giving a live performance, without an audience, spread the word and visitors from all over the world turned up and continued until she retired. The hotel alongside, not exact ply a Hilton, was ‘the Lost Highway Hotel’ in David Lynch’s film of the same name. A documentary about Marta Becket and the opera house won an Emmy in 2003. We move on and are soon inside the Death Valley National Park. This is an incredible place, absolutely fascinating. 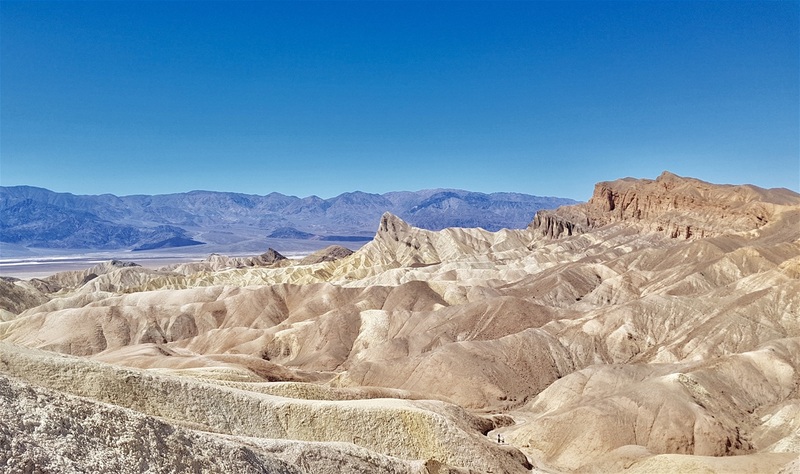 The Death Valley National Park website informs us that it is ‘America’s Hottest, Driest, and Lowest National Park’. 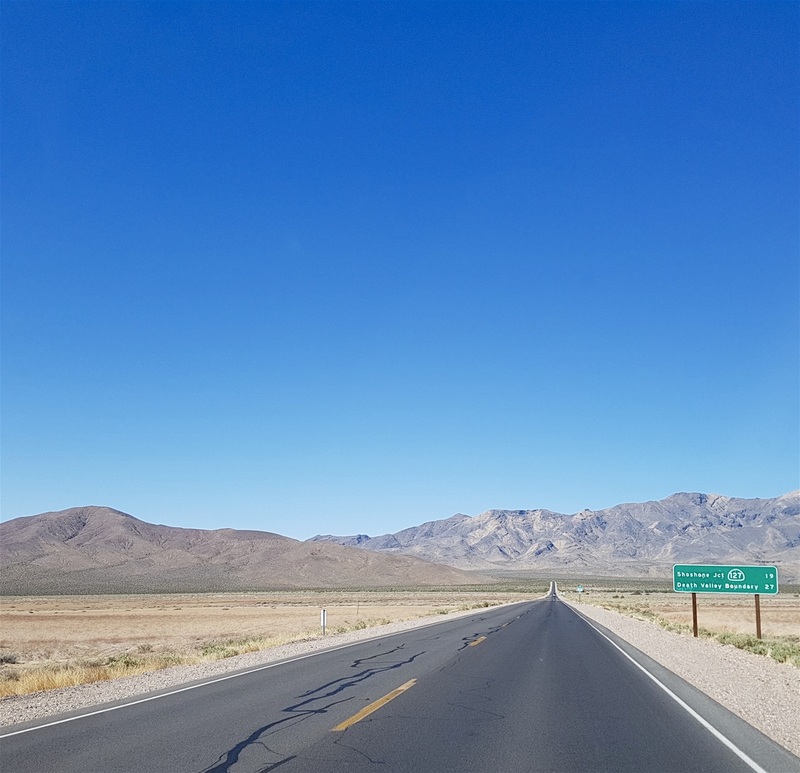 The valley floor is 272 feet below sea level and yet the highest point in Death Valley itself,Telescope Peak, rises to 11,043 feet and only a mere 84 miles away is Mount Whitney, the highest point in the US at 14,595 feet. Hottest? Oh yes. 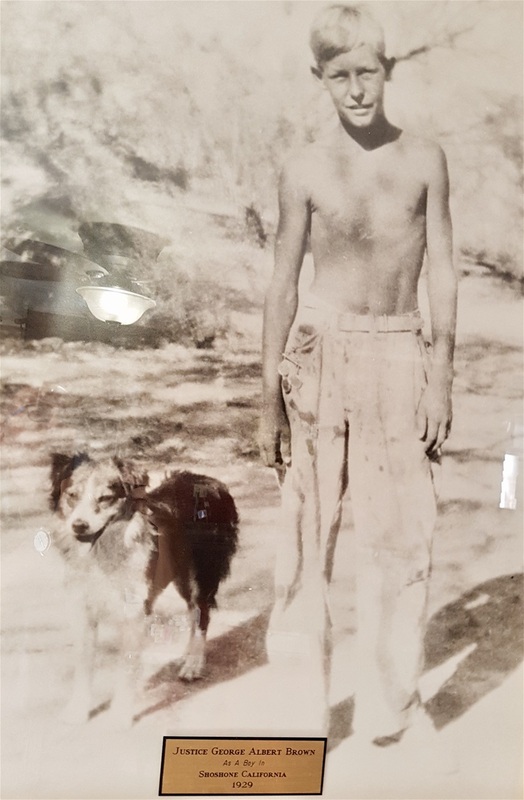 The appropriately named Furnace Creek in Death Valley holds the record for the highest recorder air temperature in the world, 134 °F (56.7 °C) on July 10, 1913. The ground temperature can go much higher as the rocks absorb the heat and was once recorded at 201 degrees. Thankfully, it was a fair bit cooler than that today. We pass through Furnace Creek and the shade temperature here is a mere 88 degrees. The locals are probably looking out their pullovers. Not that there are many locals here. The ‘permanent’ population was lasted at 24 at the 2010 census, down from 31 at the 2000 census. 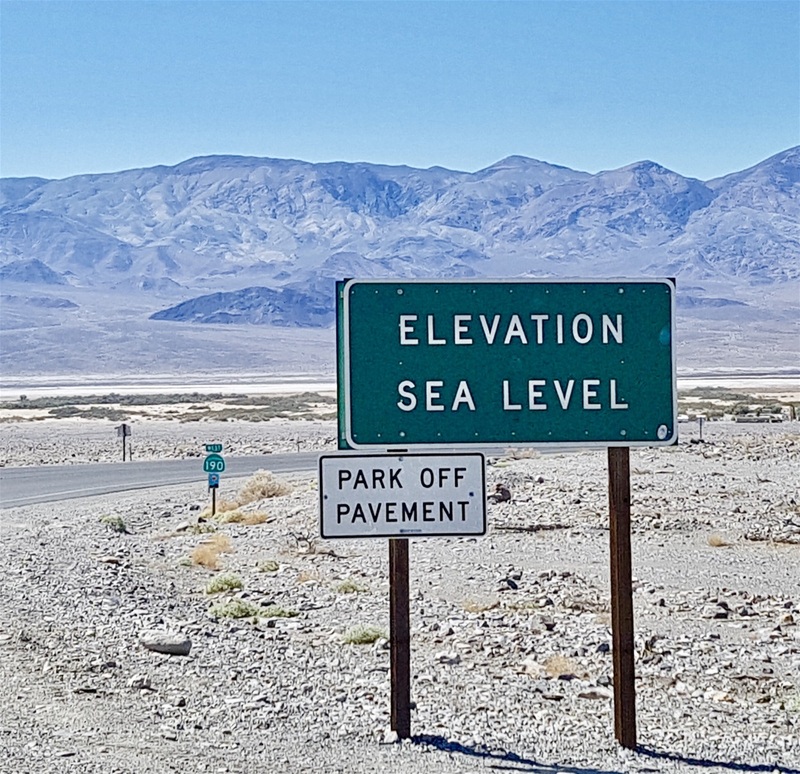 The sign at the entrance says the village is 190 feet (58 m) below sea level. There’s a ranch here, a visitors centre, a petrol station and even a golf course attached to the ranch. The Furnace Creek Golf Course (originally Death Valley Golf Course) claims to be the lowest in the world, at 214 feet (65 m) below sea level. Some of the ranch lodges are closed down when temperatures get up to 125 °F (52 °C), but the golf course remains open; they even set up a summer tournament in 2011 called the Heatstroke Open, and 48 people entered. It doesn’t say how many survived. 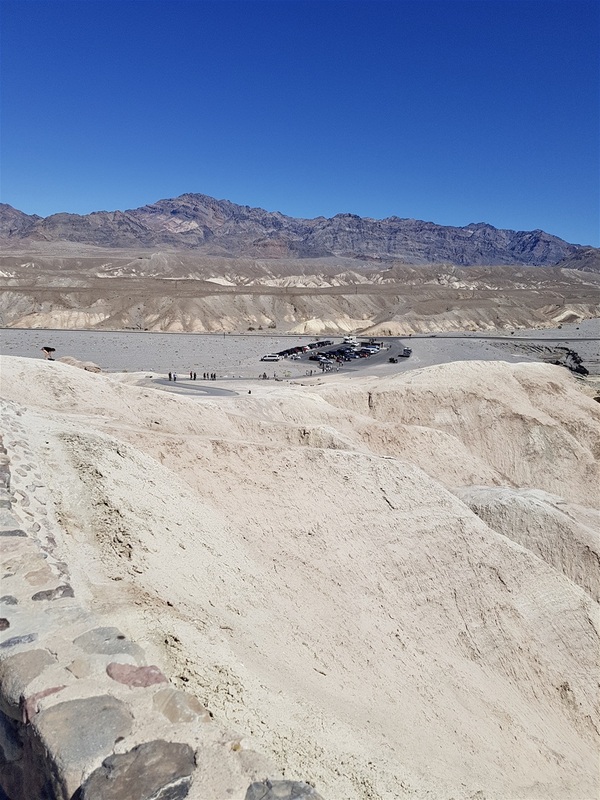 We went instead to Zabriskie Point. Basically, it’s a desert viewpoint with fantastically shaped rocks all around, but we knew it from the 1970 film of the same name which we both remembered going to see in Notting Hill. “This is such a silly and stupid movie, all burdened down with ideological luggage it clearly doesn't understand, that our immediate reaction is pity,” was a typical critic’s review at the time. The director, Michelangelo Antonioni, whom I suspect was Italian (!) had a surprise hit with Blow Up at the height of the Swinging London era. From what we remember, that critic got it about right. The two stars were unknowns. Mark Frechette was ‘discovered’ when he was spotted having an argument at a bus stop by Antonioni’s assistant, who reportedly told the director, ‘he’s only twenty and he hates everything,’ or words to that effect while Daria Helprin was spotted in a documentary on the hippie movement. The film was a disaster, but later became a ‘cult classic,’ not that makes it any better, of course. We arrive at the car park and study the line of people making their way up a very steep hill to the top. They’re walking very slowly and look tired. Marigold refuses to get out of the car! ‘You go and I’ll look at the photos later,’ she says. Wish I’d thought of that. I walk to the top of the hill, at a good pace without stopping, and arrive at the summit as fresh as a daisy. A woman asks me if I mind taking a photo of her and her friend and, within no more than three minutes I find enough breath to say, ‘of course.’ It’s very hot up here, the sun is baking and the surrounding rocks retain the heat. I take some photos – it’s well worth the effort of getting here – and rejoin Marigold who says the man from the next car had to lie down on the back seat when he got back. ‘Wimp,’ I say, looking longingly at our back seat. It’s only a bit of a hill, but a steep one, and the heat, in full sun, is pretty sapping. Later, I discover interesting stuff about both of the film’s star actors. Darla Helprin lived for a while in a ‘free love commune’ – California, 1970, right? – and then married Denis Hopper while Mark Frechette was arrested after robbing a bank ‘to protest against Watergate’ and killed by another inmate in prison. We end up in Beatty, just outside the far entrance to the park and Beatty is just wonderful. More of that in our next blog post. 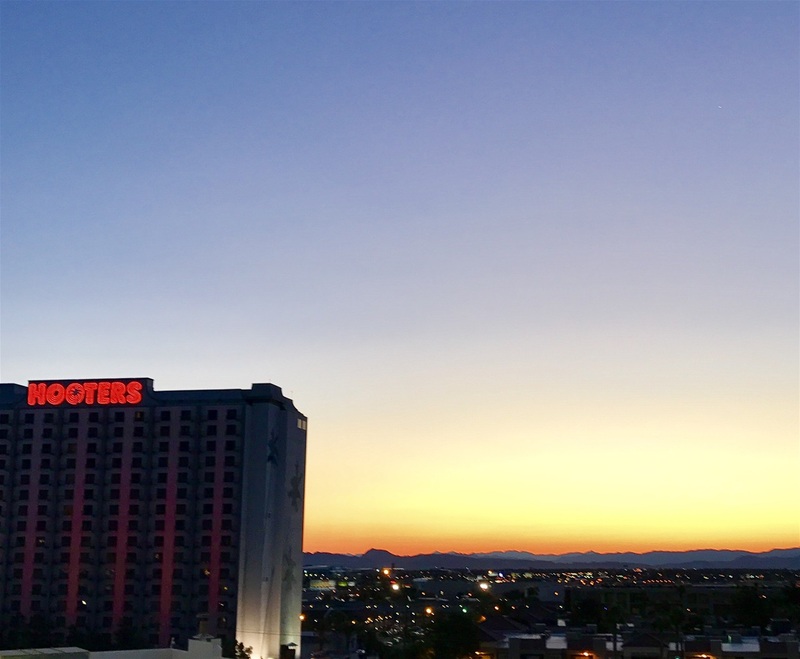 Dawn breaks on, er, Hooters. Car mostly filled by Ken. 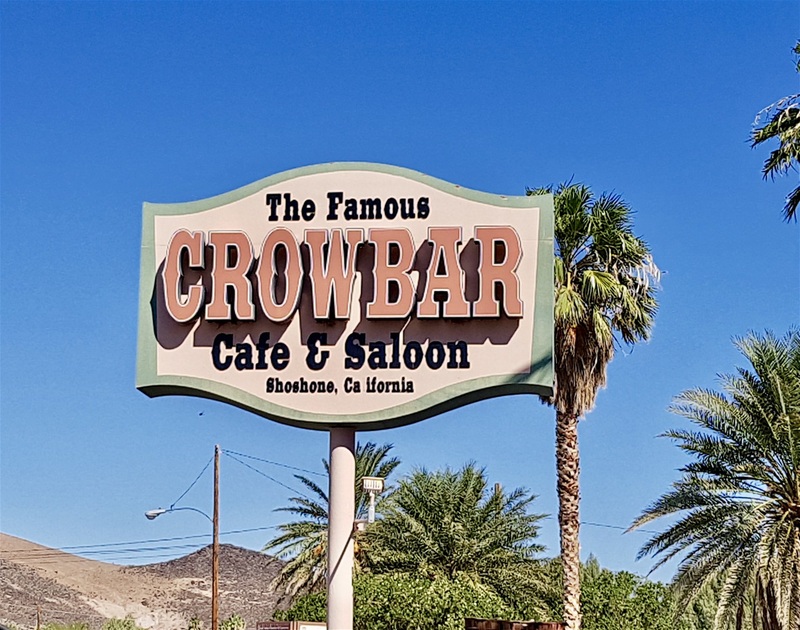 Not named for a crowbar, it's the Crow Bar. Here's the crow. Marigold is down there somewhere, with the car air con turned up to maximum. Road still heading downhill from here. Eighteen miles from here to there. Not much to see.